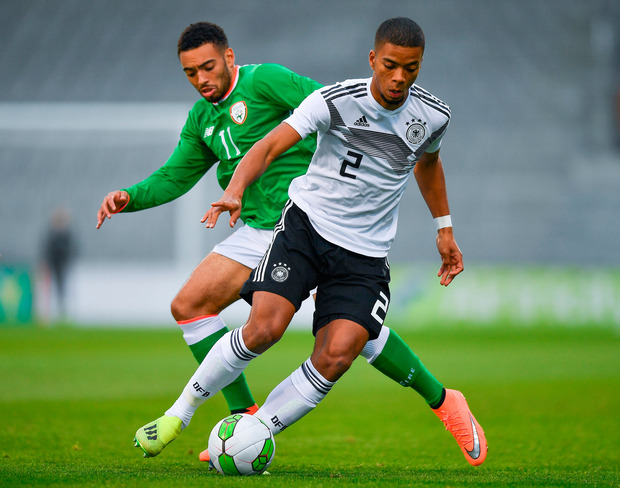 Ireland's aspirations of automatically qualifying for next year's Under-21 European Championships are all but over after group leaders Germany hammered Noel King's side at Tallaght Stadium yesterday to soar five points clear with two games left. Although three of the visitors' goals came from penalties, two by hat-trick hero Cedric Teuchert, they were far superior on a chastening night for the young Boys in Green. King's crew can only hope to extract as many points from next month's their final games, both away from home against Israel and Germany, to try and push for a play-off. Norway went level with them in second on 14 points by beating Azerbaijan in the other Group Five fixture. King made two enforced changes to his back-four from Friday's 1-1 draw in Kosovo and the new-look backline looked ragged from the start. Sean McLoughlin came in for the injured Danny Kane at left-back while his former Cork City teammate Ryan Delaney got the nod over the returning Shaun Donnellan to fill the vacancy left in the heart of the defence by Ryan Sweeney, who was suspended along with Ronan Curtis. The group leaders showed their intent from the outset with Benny Henrichs hooking a shot wide inside two minutes. Ireland were already living dangerously and the recent Monaco recruit teed up the opener four minutes later by nutmegging McLoughlin on the edge of the box to allow Aaron Seydel turn and stroke the ball into the bottom corner. It did soon become two and once again Ireland played a part in their own downfall. Jake Mulraney, the other newcomer to the side in place of Curtis, was caught on his blindside by Lukas Kolstermann's surging run into the box, eventually diving in to commit a foul. Up stepped Teuchert to tuck away the spot-kick to the right, sending O'Hara the wrong way. The away side upped the gears in the second half to inflict the heaviest defeat on Ireland in King's eight-year term. After getting gifted a third on 65 minutes when O'Hara's weak clearance was collected by Newhaus and teed up for Teuchert to send a rising shot into the roof of the net, he notched his hat-trick eight minutes later. Liam Kinsella's foul Max Eggestein offered Teuchert another opportunity to hammer a penalty home, which is did with aplomb. Two goals by half-time substitute Suat Serdar completed the rout. On 82 minutes, he converted another penalty, with Mulraney once again tripping Lukas Kolstermann, before back-heeling in a second four minutes later to compound Ireland's misery.